Greetings again from the darkness. It’s been more than 70 years since the Second World War ended, and it’s still producing fascinating stories, books, and movies. Director Sean Ellis co-wrote the script with Anthony Frewin after tireless research into a secret mission of the Czech resistance known as Operation Anthropoid. The purpose was to assassinate SS General Reinhard Heydrich, third in command of The Reich behind only Hitler and Himmler. Hitler invaded Poland the year after taking Czechoslovakia and put Heydrich in charge. In addition to being the main architect behind the Final Solution, Heydrich became known as “The Butcher of Prague” as thousands of citizens were slain under his reign of terror. The story is split into two distinct parts … the buildup and the aftermath. 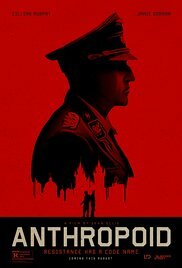 It’s late 1941 when we see Jan Kubis (Jamie Dornan) and Josef Gabcik (Cillian Murphy) parachute into the territory outside of Prague and make their way to the city only to discover their contact has been killed. Over the next few months, the two soldiers spend time planning, observing and blending in, while living with their host family – the Moravecs. They become attached to two local ladies (Charlotte Le Bon, Anna Geislorova), first as cover for the mission, and then in a more personal manner as tension builds and the mission gets closer. Many of the original, historic and actual locations are used which adds an element of realism to a story that’s already plenty real and emotional. The second half of the story is what happens after the assassination. Seven of the original parachutists go into hiding in the basement of the Saints Cyril and Methodius Cathedral. The manhunt is brutal and extensive, and once the hideout is discovered, a seemingly unending parade of German soldiers and ever-increasing weaponry are unleashed. It’s a beautifully filmed, but gut-wrenching scene … think of the last stand at The Alamo. An extended shootout (6 hours in real time) may not seem like a fun day at the movies, but this story goes to the bravery and desperation of those who refused to give in to the relentless savagery of the Germans. In addition to Ms. Le Bon and Ms. Geislorova, Czech screen vet Alena Mihulova is another standout here. The pacing of the story telling is a bit off at times, but director Ellis brings historical accuracy to a fascinating story in ways that movies such as Valkyrie and Inglourious Basterds didn’t even attempt. As courageous as those in the resistance were, the aftermath and reprisals do beg the question … was it worth the price? Not an easy question to answer even in hindsight. This entry was posted on Friday, August 12th, 2016 at 7:38 am and is filed under Thriller, War. You can follow any responses to this entry through the RSS 2.0 feed. You can leave a response, or trackback from your own site.